You are currently browsing the tag archive for the ‘frank breech’ tag. I know the fetus is flexible, but can this be comfortable? Well I got over my chest cold, only to be hit by another sinus cold less than a week later that my son brought home from daycare. Those little people sure are germ factories! I learned or was reminded that your immune system in pregnancy is naturally suppressed so that your body will not reject the pregnancy. Which makes me much more susceptible to cold and flu’s coming through our house. I think I have more of less recovered now and the just have the lovely extra mucus that pregnancy brings. Last week, I think it was Friday night April 2nd I started having Braxton hicks, which in and of themselves are a normal thing of a healthy pregnancy. Mine were accompanied with more muscle pain of the muscles bellow my belly and were tender to touch, and then a back ache. I do have a bad back, but in pregnancy thus far the relaxant hormone present in my system has normally worked in my favour. I was also having a sharp pain in the middle lower abdomen. I started to worry that it could be pre-term labour. After little sleep on Friday night I called my midwife on Saturday and she said from what I was describing it did not sound like pre-term labour. She suggested a couple things, one being more liquid calcium, and also ensure I was remaining hydrated (which I have been, drinking at least 2 liters of water a day), also rest and warm bath. Things subsided a little but not a lot. I went in on Monday and she did an internal exam to confirm things were indeed fine and there was no evidence I was going into labour. On Thursday we went in for our regular midwife appointment and the pain was still on and off . To put my mind further at ease she ordered another ultrasound. I didn’t think we’d get into for an ultrasound for another week or so, but the next day Victoria General Hospital called in the afternoon and said they could fit me in that same day in a couple of hours! The technician ended up being a sister of a friend, small world! I recognized her as we went into the room. 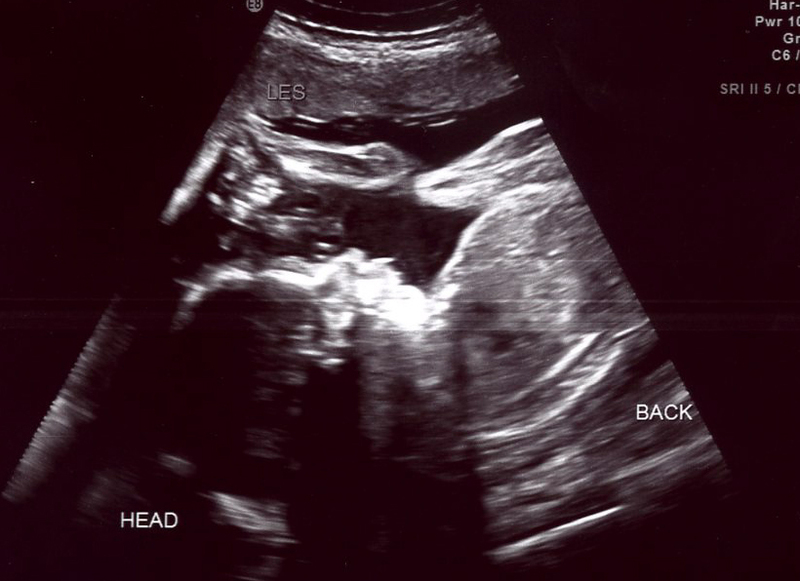 As she was going through the ultrasound she let us know things looked fine and pointed things out. She checked my cervix before I emptied my bladder (yes you still have to drink some water before the ultrasound) and after and confirmed it was a normal length. She also mentioned my amniotic fluid level was normal, and she pointed out the heart, kidneys, and a couple other organs and said they looked fine. She also took more measurements of the baby. As for the pain and discomfort they continue, and so do the Braxton Hicks. It is hard to get enough sleep currently. The calcium helps a little I think?! My midwife is pretty sure the sharp pain in the middle front I am feeling is pelvic symphysis pain. I also have lower back pain that comes and goes. I will continue with chiropractic and acupuncture to see if that can relive a little discomfort. I am also going to go back to the pool, which I have been away from for at least about 6 weeks with all my colds. My midwife doesn’t recommend the kind of swimming I am used to (I swam with a Masters swim club), but something a little more relaxed. That may help coax baby to get into a better position too, or that’s my hope!